Tina Turner in Gianni Versace, by Thierry Perez, 1992. It's been a rather slow month for posts as I concentrate on commissions, the new issue of Decoy, my book, and eating my own weight in christmas snacks. However this little delight surfaced on Tumblr this morning that I've never came across before, and it ought to be shown. I consider myself to know quite well which pieces of Thierry's work is online, and know there is a vast amount that isn't up, high quality or not. 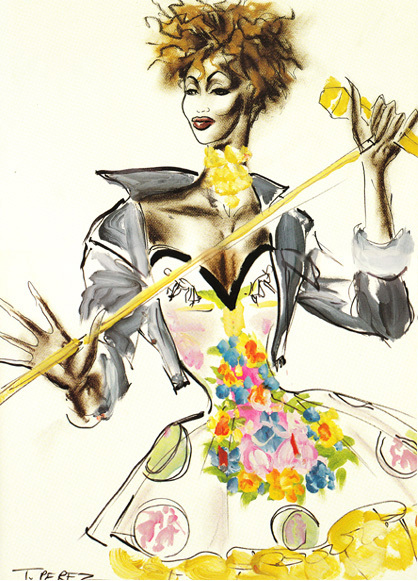 So it's great to discover this gem, Tina in Gianni Versace Spring Summer 1992. Don't forget the huge post on the rest of Thierry's work here.